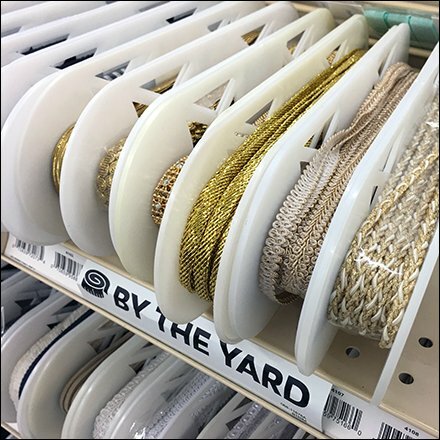 If you can’t quite fit enough material on a standard circular spool, consider this Elliptical Spool Ribbon Shelf Merchandising. Not only will it manage more ribbon per facing, but being flat sided, it can’t accidentally roll off the shelf during handling. Consider the vast choices in the Elliptical Spool Ribbon Shelf Merchandising galley of images. This concept seen at Jo-Ann Fabrics and Crafts.